Wives of CEO are power influencers behind corporate decisions. Welcome to the world of ‘Wife of CEO’! Interview ‘De ondernemer | Brbants Daglad’ dated 17th of December 2016: ‘Spouse of general manager not at all to be envied’. Spouses or lifetime partners of CEOs have an extraordinary life. Generally, they are expected to support their husband: he indeed earns the major part of the income. Some wives are highly educated and / or of better descent and are well appointed to have a life of their own. The biggest risk, however, is their loss of (mental) independence, self-esteem, personal goal and their own story. Women who completely identify with the supporting role as ‘wife of’ ‘and ‘mother’ get over the edge, whether or not stimulated by their upbringing. One of the effects of this could be that the husband at some point no longer is enthralled by the female identity of his own wife and he starts to look for other more tantalizing women – or who effortlessly cross his path. It’s not an accident, unfortunately, that divorces are so common in the upper levels of business. Video: How to be ‘Wife of a CEO’ and ‘Yourself’ at the same time! The solution for your troubled emotions is awareness. As the wife of a CEO you can learn to see your role and the fact ‘support’ in a broader perspective. Support is certainly not a synonym for ‘sacrifice’. That all has more influence on him than you only being limited in confirming his position and ego and mother him. Above applies to many Western women and even more for women of CEOs from Asia or other areas where the social position of women is more weak. If such a woman gets in an expat-situation due to the job of her husband the challenges become even greater. Should she thus logically move abroad with her CEO? Abovementioned is extensively covered through the online coaching program ‘Rise your power’ which I have specially designed for you, wife of a CEO, because I have learned through own experiences and from life stories I have heard through my clients and my extensive network. Interested? Download my free e-Book ‘Wife of CEO insider tips’ with some practical suggestions. Are these suggestions appealing to you and would you like to change issues in your life structurally? Sign up for the online training program ‘Rise your power’! Being visible, being supportive, being his sparring partner, being inspiring…. Any woman, married to a business leader, realizes this role could lead to insecurity; she might also become a burden rather than a blessing. If you want to be more happy in this role: learn to take your stage! 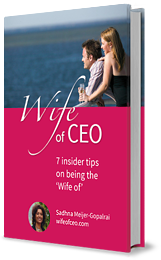 Download my free e-Book ‘Wife of CEO insider tips’ with some practical suggestions.